The WDFOA uses the NFHS Football Rules Book. Copies of the Rules Book and Case Book will be distributed at training sessions for new officials, and at the State Rules Clinic before the season for current officials. Maryland has adopted the following rule regarding the use of running time. 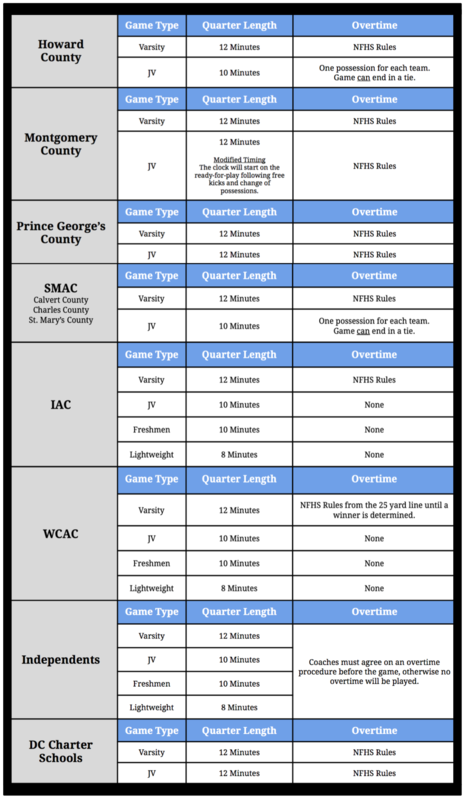 After the first half, any time the score differential reaches 35 points or more, the following changes (and only these changes) will be made regarding the rules determining when the clock will and will not be stopped. A player is injured or apparently injured. A charged (team) timeout occurs. A score occurs that reduces the point differential to less than 35 points. Review overtime procedure in pre-game conference. Referee and Umpire meet with head coach and captain(s) of each team in the center of the field. Referee explains overtime procedure with emphasis on options of the toss. Referee instructs visiting team captain to give “heads” or “tails” choice before the coin toss. Referee repeats choice so that the Umpire hears selection. Toss winner shall choose whether to be on offense or defense, or choose the end of the field at which the ball will be put into play. Referee indicates winner of the toss by placing a hand on the player’s shoulder. Referee then positions the offensive captain(s) facing the goal toward which the ball will be advanced, and the defensive captain(s) facing their opponents and opposite goal line. Referee gives first-down signal toward the goal being used. Each team shall be permitted one timeout during each overtime period (previously unused timeouts cannot be used in overtime). If the defense gains possession, the ball is dead and the series is over. If the game remains tied after any overtime period, repeat the same procedure, however there is no coin toss. First choice is alternated in all extra overtime periods.